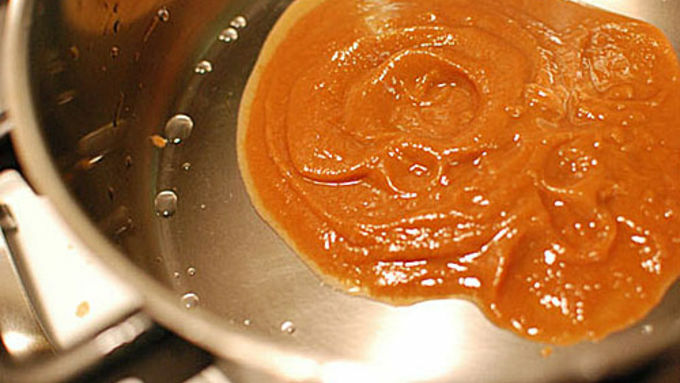 Make tamarind paste. Peel the hard shell off the tamarind pods and place them in a pan with enough water to come about 3/4 of the way up the pods. Simmer this for about 15 minutes until the pods are very soft and the water is brown. 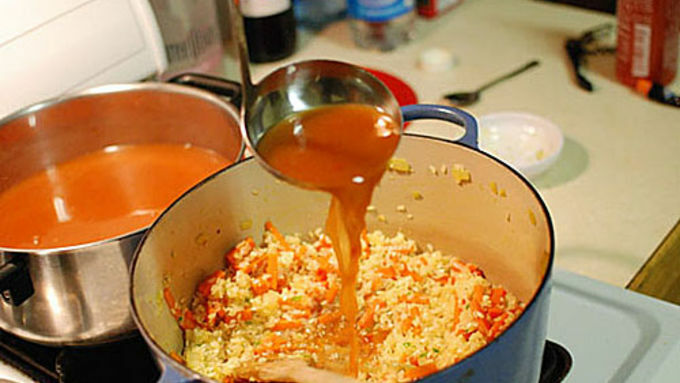 Mix this paste with the sriracha, fish or soy sauce, brown sugar, and chicken stock to form the stock base for this risotto. Add a cup of water to this mixture and place it on the stove on low heat. Chop and prep all of your ingredients. Get the shrimp ready, crack and whisk the eggs, cut the tofu into 1 inch squares, make 1/2 inch matchsticks out of the carrots, dice the onion, roughly chop the bean sprouts, and slice up the green onions. 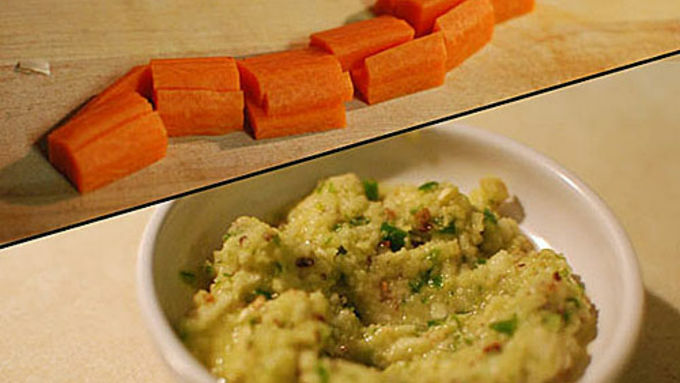 and in the food processor, make a paste from the chiles, garlic, and ginger. If you want it mild, take the seeds out of the chiles, if you like it hot, leave them all in! Take about half of the chile, ginger, garlic paste and toss the shrimp in it. Now we are ready to start cooking! Saute the carrots and onions in a small amount. After about 5 minutes, add the chile, ginger, and garlic paste to the pot. Next add the rice and stir to coat. Slowly ladle in the pad thai chicken stock little by little as the rice cooks, stirring often. This process should take about 30 minutes. While the risotto cooks, in a frying pan with oil over very high heat, fry the tofu. When it is browned on all sides, remove from pan. 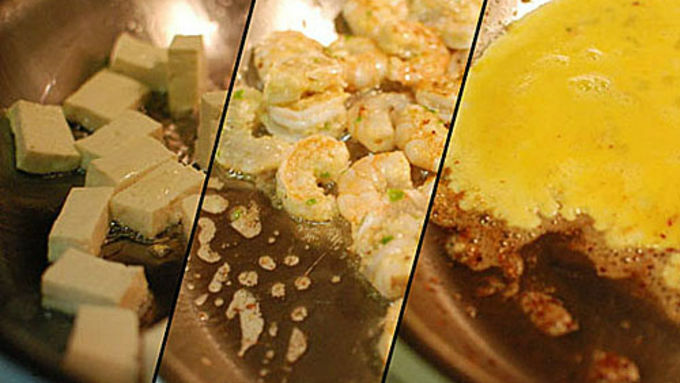 Fry the shrimp in that pan for about 2 minutes only and remove. Lastly, cook the egg until scrambled and remove from the pan. 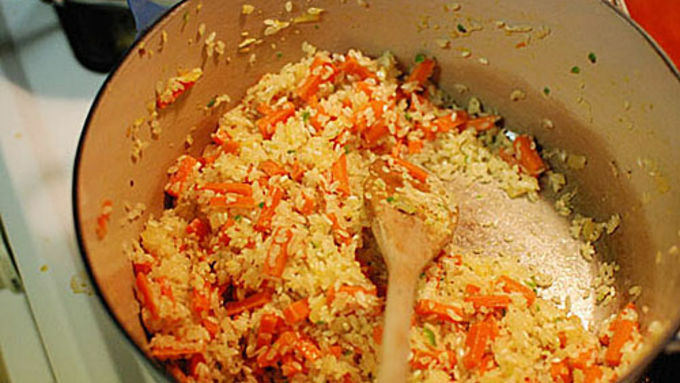 When the risotto tastes tender and fully cooked, remove from heat. Stir in the shrimp, egg, bean sprouts, and scallions. Garnish with the peanuts (chopped), lime, and the fried tofu! Sometimes when people ask me what my favorite type of food is, I pause for a long time. One side of my brain wants to say Italian. I grew up eating Italian every day. It is close to my heart, brings back all sorts of memories, and nothing on earth can comfort my soul like a bowl of pasta. The other side of my brain screams out for the Asian flavors in Thai and Indian food. If there is an Italian restaurant next door to a Thai place, I guarantee I have never been there. These cuisines represent freshness and excitement to me. And spice! It’s hard to merge these two loves of mine, but when everything hits just right, it becomes magic! I have had many failures along the way, but they were worth it for a dish like this. 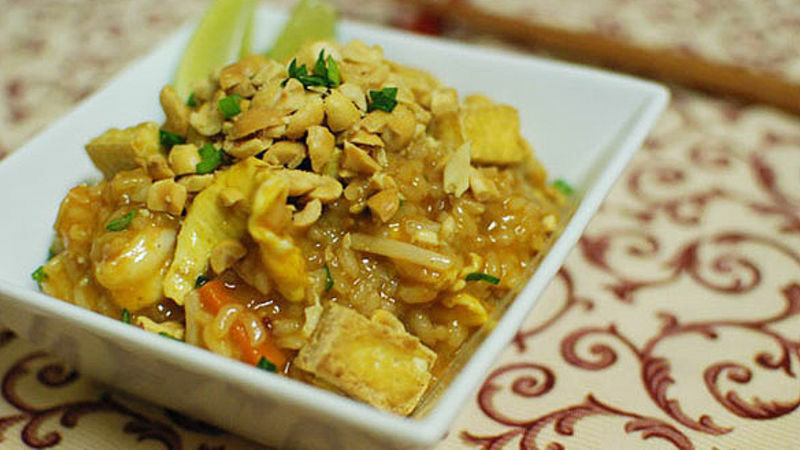 Creamy Italian style rice, crunchy peanuts and tofu, tangy hits of tamarind and lime, spicy sriracha, and the deep savory flavor of the stock. When tackling exotic flavors, I think it is nice to find recipes that only have one ingredient that you are not used to working with. 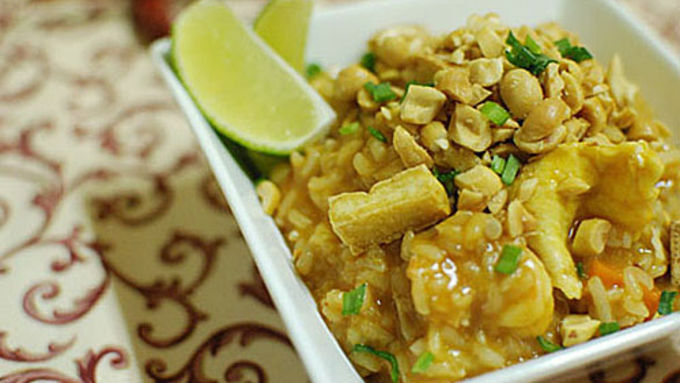 For most people, with this recipe, it will be the tamarind. 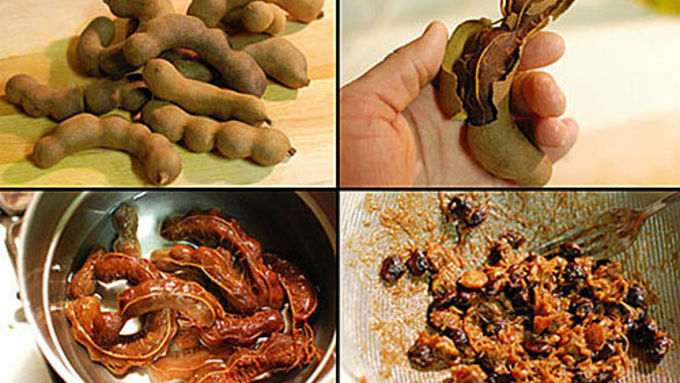 Tamarind is one of my favorite ingredients to use! I eat it raw right out of the pod. It may seem like a bit of work, but it is a fun and different meal to make with some friends on a Saturday afternoon. And you will feel like you really accomplished something!